Brittany Dawn is a fitness coach and influencer with a huge Instagram and YouTube following. That's how many of her customers found her, but several say they didn't get what they paid for. DALLAS — Inspiration rules the internet, and if you're scrolling through social media and looking to get in shape, it's not long before you find Brittany Dawn. "Everything was popping up 'Brittany Dawn Fitness.' 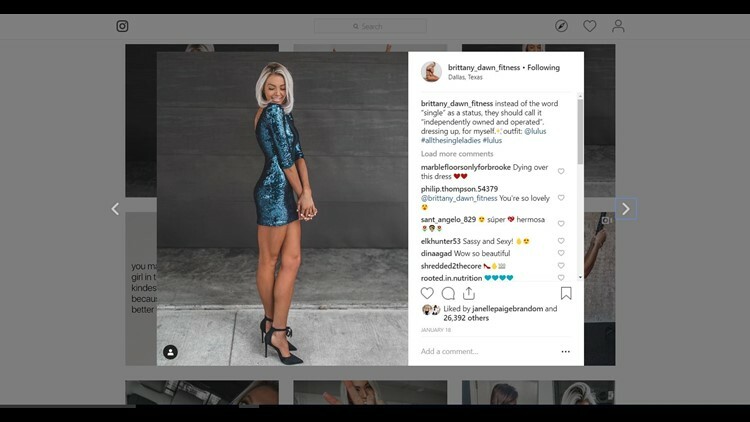 Everywhere," said Melina Brunson of Allen, who found the influencer on Instagram. In fall 2017, Brunson had a new baby at home, and found motivation in the Dallas fitness influencer's posts. "It’s all aesthetically pleasing, she’s visually beautiful in a lot of people’s eyes," Brunson said. "I bought into it!" She bought into it — so did some 550,000 others on Instagram, and another 290,000 on Youtube. It was enough to sell Brunson, who went to Dawn’s website and spent $250 for a 60-day plan of workouts, the promise of personalized nutrition and access to Dawn as a trainer by phone. "I had the ability to text her with any problems or questions, but that didn’t really come through," Brunson said. Brunson committed to the program, but weeks later, she felt Dawn didn’t. "We’d go weeks at a time without communication," Brunson said. "There would be something I’d need to know that morning, and I wouldn’t hear back from her until that night, maybe until a week later. I mean, what kind of access is that?" It seems that was the norm, according to many of the thousands of women from across the country in the Facebook group Brittany Dawn Fitness Complaints. Few got a response, much less their money back. Women like Kayla Lippens from Michigan, who’s out $175. "It took her like over six weeks to reply to me," Lippens said. "I just can’t imagine her stealing all this money from people. It’s not OK."
Complaints span several years, and the pressure must have mounted. Dawn declined going on camera with us, but posted this video last week. Reading a prepared statement, she said her business got too big too fast, and promised unhappy customers she’ll make things right. "I am sorry for anyone who feels hurt or scammed by anything of this nature, that was never my intention," Dawn said through tears in the video. But this time, Brunson’s not buying it. "I don’t think it’s with good intention," she said. "I think it’s because she got caught." "Brittany Dawn Fitness has and will continue to acknowledge the concerns and questions of our customers through direct conversations with each of them. I have set up a monitored customer service email where I have been able to accept and rectify more than half of the complaints through make-goods, refunds, and plans extensions, depending on each specific situation. Brittany Dawn Fitness and each of our stakeholders hope to positively move forward by working to put communication and quality fitness plan execution policies firmly in place so this will never happen again."